I’m always so sad when the end of strawberry season rolls around, but I would be less so if I remembered that peach season was just around the corner. We get beautiful peaches in Maryland, sweet and juicy and perfect, every summer. I’m always so delighted to see the peaches in the pickup, and I’m very careful when loading them so as not to squeeze them against other vegetables and break their skins. I’ll let the bread get all squished before I bruise a peach. 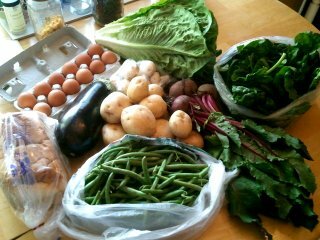 Anyway, week 3 of the summer CSA: spinach, a head of romaine lettuce, patty pan squash, white mushrooms, a pint of blueberries, English peas, cucumbers, peaches!, eggs, and bread (Great Harvest onion rye). 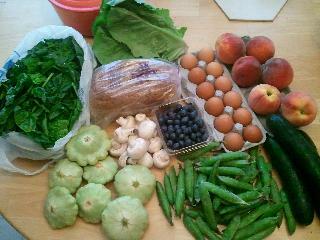 Week 2 of the summer CSA and the greens are really starting to roll in. 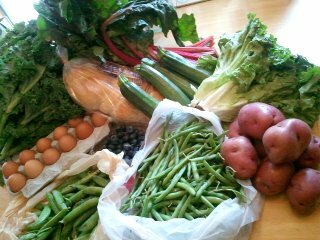 We got kale, chard, green leaf lettuce, zucchini, green beans, English peas, red potatoes, blueberries, eggs, and bread (Great Harvest challah). Looks like I’ve got another night of preparing green things in my future. I knocked out most of the veggies from last week in one evening, and stuck them in the fridge in sealed containers. I used to assemble dinner from raw ingredients, but now that we have the kid at home, the weeknights are a lot busier. I find it easier to consume vegetables on busy weeknights if they’re already prepped. If you don’t want to eat spinach raw, it cooks down incredibly easily. Just give the leaves a rough chop, wash them well (CSA spinach is so grimy that it needs about three rinses), and then put them in a pot on medium heat with a little water still clinging to the leaves. Season to taste; I sprinkle with salt, pepper, and garlic powder. Stir occasionally. The leaves will wilt down to about a quarter of their previous volume. I serve it just like that, as a side, but I’ve also been known to mix it into quiches, omelets, or cheesy bakes. This time, I prepared pattypan squash by cutting off the stem, chopping the remaining flesh into chunks, and then sauteing them in butter with some salt and pepper, until everything is soft and cooked through. The squash also works well roasted in the oven. I’m always happy to see beets, because then I get long and luxuriant beet greens. I just cut them up, stems and all. I wash everything in the salad spinner, and then saute the pieces in olive oil with a pat of butter. Season to taste. I prepared the chard in the same way. The chard stems were narrow, so I tossed everything in at once, but if the stems are thicker, I put them in before the leaves so that they get more cooking time. 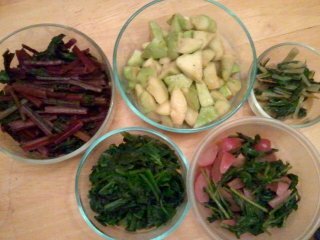 The remaining dish contains radishes and radish greens, braised in butter (see this post for the recipe link). I also made Mom’s cucumber salad with the cucumbers, but it’s not pictured as it was chilling in the fridge at the time. If the harvest is good, belonging to a CSA means that you’re drowning in a bounty of vegetation. However, if you don’t eat it, it goes to waste. In the past, I’ve pulled wilted brown vegetation out of the produce drawer, and tossed it sadly in the garbage. By doing my prep work early, I hope not to waste a single item. So far, so good! 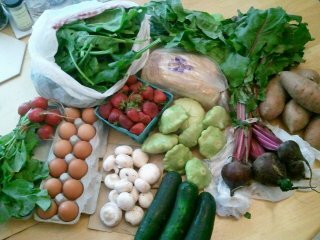 This week: spinach, lettuce, beets, sweet potatoes, pattypan squash, cucumbers, white mushrooms, a quart of strawberries, radishes, eggs, and bread (Great Harvest white). Seeing the pattypan squash always makes me slightly nervous because my skin reacts poorly to something in the squash — the first time I cut some up for cooking (they’re great sauteed in butter, with a little salt), my left hand got red and swollen. (My right hand was fine; it was holding the knife.) Now I wear gloves when preparing squash. Fortunately I seem to be able to eat it without any problems. We didn’t cook anything yesterday so most of this food is still sitting in the fridge. I did cut up some strawberries to have with ice cream, though. I’ve also been nipping a strawberry or two every time I open the fridge. I have a feeling the strawberries won’t be around for very much longer. In case you haven’t heard of the snakehead fish, it’s an invasive Asian species that’s gotten into Maryland and Virginia waters. It’s scary, a voracious predator with no natural enemies in these parts, and it takes very good care of its young, ensuring that large numbers of them survive to reproduce. It’s freakishly hardy, able to breathe air and survive for days out of water. US Fish and Wildlife have been trying to contain the population explosion, but the snakeheads are flourishing. Enter Whackfactor Outdoors and the Potomac Snakehead Tournament. They set up a tournament with cash prizes for whoever could bring in the heaviest snakehead catch within a set amount of time. As a bonus (and this is what caught K’s attention), local chefs would prepare delicacies with snakehead. K has long been saying that the cure for invasive species is for humans to eat them. Humans, after all, have hunted species to the brink of extinction time and time again. If anyone can take out a species, it’s us. We showed up at the tournament near the end, for the Invasive Species Tasting (open to the public). I was delighted by the quality of the free snakehead delicacies. 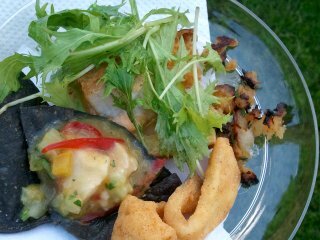 On my plate: snakehead ceviche on a tortilla (courtesy the chef from Alewife), a snakehead crostini with microgreens (courtesy the staff of Dino DC), and fried blue catfish (apparently also an invasive species). It was fabulous food; everything was delicious. I didn’t take notes on the flavors, but I would cheerfully go out to the restaurants if they put those dishes on the menu. People, if you see snakehead on the menu, snap it up! I’m sure we can eat these invaders right out of the Potomac, if we put our minds to it. By the way, the tournament ended up removing over half a ton of snakeheads from the area. Kudos to the hardworking tournament contestants! That’s a head of romaine lettuce, some spinach, beets, white potatoes, eggplant, green beans, and the usual eggs and bread (Great Harvest challah). I really love getting the beets because it’s like getting two vegetables in one — you can eat the beets, and you can saute the greens as a separate side. 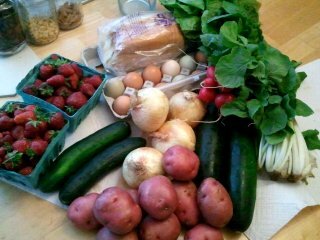 Week 12 brought more strawberries, cucumbers, red potatoes, Vidalia onions, really big green zucchini, radishes, and white chard. I got Breezy Willow eggs this time, and a loaf of Great Harvest’s Old-Fashioned White. I love it when we get double quarts of strawberries — makes it easy to split the share. I’ll miss the Vidalia onions, since the summer CSA is local whereas the spring CSA is far-ranging… but Vidalia onions are easy enough to get at home. I never mess with Ina Garten’s recipes. They’re unfailingly reliable.